Not sure how this depicts The Hanged Man? Click here. Etteilla: Prudence, Discretion, Restrained, Prognostication, Prophet. Lévi: The Hanged Man is the adept, bound by his engagements, and spiritualised, that is, having his feet turned towards heaven; it is also the antique Prometheus, expiating by everlasting torture the penalty of his glorious theft. 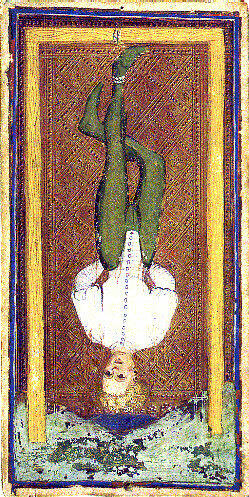 Illustration (left): The Hanged Man (attributed to Bonifacio Bembo) from the Pierpont Morgan-Bergamo Visconti-Sforza Tarot (mid-15th century) (from The Visconti-Sforza Tarot Cards by Michael Dummett, copyright &COPY; 1986 George Braziller). Click the image for a larger one. Christian: The Hanged Man is the sign of violent death encountered by tragic accident or in expiation of some crime, and accepted in a spirit of heroic devotion to Truth and Justice. Papus: The revelation of law involves punishment for him who violates it, or elevation for him who understands it; and in the Hanged Man we find the ideas of punishment, of violent death, voluntary or involuntary. Felkin: The card depicts sacrificethe submergence of the higher in the lower in order to sublimate the lower. It is the decent of the Spirit into Matter, the incarnation of God in man, the submission to the bond of matter that the material may be transcended and transmuted. Illustration (left): The Hanged Man from The Hermetic Tarot by Godfrey Dowson (copyright &COPY; 1979 U.S. Games Systems). Click the image for a larger one. Waite: He who can understand that the story of his higher nature is embedded in the symbolism of the Hanged Man will receive intimations concerning a great awakening that is possible, and will know that after the sacred Mystery of Death there is a glorious Mystery of Resurrection. Wirth: The Hanged Man does not tread the earth on which mortals find their support, for properly speaking, he is not an earthly being, for material reality escapes him. He has discerned the vanity of individual ambitions and understood the wealth of the heroic sacrifice which aspires towards total oblivion of self. Case: The mental attitude suggested by the Hanged Man is Not my will, but thine. This is ever the position of the adept. Silent, unostentatious reversal of ones own life, combined with perfect tolerance of the ways of other people, is the method of the practical occultist. Crowley: This idea of sacrifice is, in the final analysis, a wrong idea. This card is beautiful in a strange, immemorial, moribund manner. It is the card of the Dying God; its importance in the present pack is merely that of Cenotaph. Gray: Surrender to a higher Being causes a reversal in ones way of life. In spiritual matters, wisdom, prophetic power, self-sacrifice. May also mean suspended decisions, a pause in ones life. Sadhu: The power of sacrifice is supreme. It is among those men, who sacrificed the most for their minor brethren, that arise the real rulers and transformers of our planetary lives. ONeill: The Hanged Mans position, suspended from the Mother Tree, must have reminded the Renaissance scholar of myths of sacrifice associated with sacred trees. Odin hung nine days from a tree. Attis castrated himself at the base of the Maternal Tree. Tarot scholar Moakley also pointed out that the Hanged Man is a shame painting, a hanging in effigy, the treatment afforded a traitor. Pollack: The Hanged Man affects us because it shows a direct image of peace and understanding. 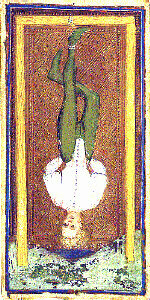 The calm shows so strongly in the card because the Hanged Man has surrendered to the rhythms of life. Turk: The hanged man represents the process of turning within and beginning to comprehend the workings of your own psyche. By inverting the focus of your conscious thoughts and transferring them from the world around you to the world within, you will soon be able to understand what motivates your every move. Symbol (top): It is best viewed sideways and depicts a man hanging upside-down from a gibbet with his right leg bent at the knee.